The General Motors engine family commonly called the LS series debuted in the then-new1997 model year C5 Corvette as the all aluminum LS1 V8. General Motors called it the Gen III small-block V8 and a year later (the 1998 model year), the LS1 replaced the LT1 small-block in Camaros and Firebirds, which was followed by the iron-block version of the Gen III V8 appearing in the full size trucks and SUVs. The LS1 displaced 5.7 liters, similar to the previous-generation small-block, but the cubic-inch measurement differed slightly: 346 for the LS1 vs. the traditional 350 cubes. In 1999, the Gen III platform spawned the higher-performance LS6 that was standard in the Corvette Z06. In 2005, the Gen IV branch of the LS family was born, differing from the Gen III with cast-in provisions for fuel-saving cylinder deactivation, larger displacements and revised camshaft sensing. The performance versions of the Gen IV include the LS2, LS3, LS9 supercharged, LSA supercharged and the LS7. GM has continued to refer its modern V-8 engine family as Gen III and Gen IV, but to the enthusiasts who quickly grasped the tremendous performance potential of the engines, every engine based on the platform has been nicknamed “LSX.” The range of production engines from the LS platform is wide. On the truck side, iron-block engines have included 4.8L and 5.3L versions, as well as all-aluminum 6.0L and 6.2L premium engines. Car engines include 5.3L, 5.7L, 6.0L, 6.2L and 7.0L displacements – including some configured for front-wheel-drive. The most distinguishing differences between Gen III and Gen IV cylinder blocks are larger bores (on some engines), different camshaft position sensor locations – indicated by a move to the front timing cover area on Gen IV blocks vs the top-rear position on Gen III blocks – and, on most Gen IV blocks, cast-in provisions for GM’s Active Fuel Management cylinder deactivation system in the lifter valley. There is great interchangeability between all LS engines, including between Gen III and Gen IV versions. Cylinder heads, crankshafts, intake manifolds and more can be mixed and matched – but the devil is in the details. Not every head matches every intake manifold and not every crankshaft works with every engine combination. Will Handzel’s “How to Build High-Performance Chevy LS1/LS6 V-8s” – P/N 88958786 – is a great reference source that outlines the more specific differences and interchangeability among Gen III-based engines. LS1 5.7L (346-cu-in) engines were produced between the 1997 and 2004 model years in the United States (Corvette, Camaro, Firebird and GTO) and stretching into 2005 in other markets (primarily Australia). The LS6 was introduced in 2001 in the Corvette Z06 and was manufactured through 2005, where it also was found in the first generation of the Cadillac CTS-V. The LS1 and LS6 share a 5.7L displacement, but the LS6 production engine uses a unique block casting with enhanced strength, greater bay-to-bay breathing capability and other minor differences. The heads, intake manifolds and camshaft also are unique LS6 parts. In 2005, the LS2 6.0L (364 cu in) engine and the Gen IV design changes debuted. In GM performance vehicles, it was offered in the Corvette, GTO and even the heritage-styled SSR roadster. It is the standard engine in the Pontiac G8 GT. Its larger displacement brought greater power. The LS2 is one of the most adaptable engines, as LS1, LS6, LS3 and L92 cylinder heads work well on it. Introduced on the 2008 Corvette, the LS3 brought LS base performance to an unprecedented level: 430 horsepower from 6.2L (376 cu in) – making it the most powerful base Corvette engine in history. 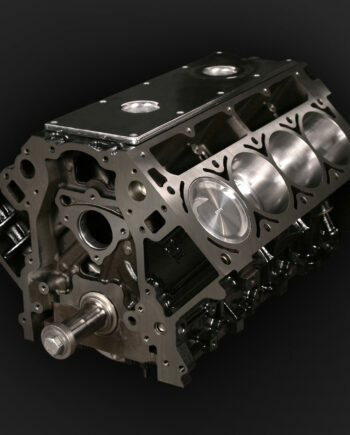 The LS3 block not only has larger bores than the LS2, but a strengthened casting to support more powerful 6.2L engines, including the LS9 supercharged engine of the Corvette ZR1. The LS3 is offered in the Pontiac G8 GXP and is also the standard V-8 engine in the new, 2010 Camaro SS. The L99 version is equipped with GM’s fuel-saving Active Fuel Management cylinder deactivation system and is standard on 2010 Camaro SS models equipped with an automatic transmission. Perhaps the most unique application of the LS engine in a car, the LS4 is a 5.3L version used in the front-wheel-drive Chevrolet Impala SS and Pontiac Grand Prix GXP. 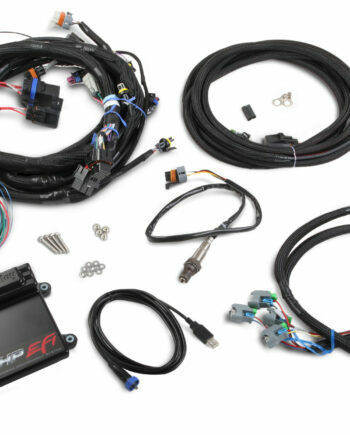 The LS4 has an aluminum block and unique, low-profile front-end accessory system, including a “flattened” water pump, to accommodate the transverse mounting position within the Impala and Grand Prix. It is rated at 303 horsepower and 323 lb-ft of torque. A legend in its own time. The LS7 is the standard engine in the Corvette Z06 and its 7.0L displacement (427 cubic inches) makes it the largest LS engine offered in a production car. Unlike LS1/LS6, LS2 and LS3 engines, the LS7 uses a Siamese-bore cylinder block design – required for its big, 4.125-inch bores. Competition-proven heads and lightweight components, such as titanium rods and intake valves, make the LS7 a street-tuned racing engine, with 505 horsepower. LS7 engines are built by hand at the GM Performance Build Center in Wixom, Mich. The most powerful production engine ever from GM, the LS9 is the 6.2L supercharged and charge-cooled engine of the Corvette ZR1. It is rated at an astonishing 638 horsepower. The LS9 uses the strengthened 6.2L block with stronger, roto-cast cylinder heads and a sixth-generation 2.3L Roots-type supercharger. Like the LS7, it uses a dry-sump oiling system. It is the ultimate production LS engine. It is built by hand at the GM Performance Build Center in Wixom, Mich.
A detuned version of the LS9, this supercharged 6.2L engine is standard in the 2009 Cadillac CTS-V. It is built with several differences, when compared to the LS9, including hypereutectic pistons vs. the LS9’s forged pistons; and a smaller, 1.9L supercharger. The LSA also has a different charge-cooler design on top of the supercharger. Horsepower is rated at 556 in the super-quick Caddy. 4.8L – The smallest-displacement LS engine (293 cu in); it uses an iron block with 3.78-inch bores and aluminum heads. 5.3L – The most common LS truck engine (327 cu in), it uses the same iron block with 3.78-inch bores as the 4.8L, but with a longer stroke , (3.62-inch)crank. Later versions equipped for Active Fuel Management. Manufactured with iron and aluminum cylinder blocks. 6.0L – Used primarily in 3/4-ton and 1-ton trucks, the 6.0L (364 cu in) uses an iron block (LY6) or aluminum block (L76) and aluminum heads, with provisions for Active Fuel Management; some equipped with variable valve timing. 6.2L – Commonly referred to by its L92 engine code, the 6.2L (376 cu in) engine uses an aluminum block and heads, and incorporates advanced technology including variable valve timing. The L92 is used primarily as a high-performance engine for the Cadillac Escalade and GMC Yukon Denali. C5R: Developed for the factory-backed Corvette racing program, the C5R cylinder block has been manufactured in comparatively small quantities since 2000. They are manufactured with a unique aluminum alloy for greater strength and undergo a variety of specialized machining and inspection processes, including “hipping” to increase strength and X-raying that ensures against unacceptable porosity. A Siamese bore design with 4.117-inch finished bores enables 7.0L (427-cu-in) displacements. The C5R uses billet steel main caps with premium, 4340 fasteners. Racing-quality head studs are also included. All LS series heads will work with the C5R block, but maximum performance depends on maximum airflow. LSX Bowtie Block (standard and tall-deck): Introduced in 2007, the LSX Bowtie Block is a durable and affordable cast iron casting that was designed to support extreme high-performance combinations, including provisions for six-bolts-per-cylinder head fastening. It has a Siamese bore design with 3.99-inch bores that must be finished to 4.00 inches – with a 4.25-inch recommended maximum bore. Maximum stroke can reach 4.25 inches, but rotating assembly interference on the cylinder must be taken into account for strokes greater than 4.125 inches; heavy metal is required for crankshaft balancing of larger-stroke combinations. Standard versions feature decks 0.020-inch taller than LS production blocks, with the tall-deck version manufactured with a 9.70-inch semi-finished deck height. The oiling system is a true priority-main system and all LS small-block heads work with the engine. Higher-airflow heads, such as LS7 and C5R, are recommended. Generally, LS crankshafts are similar in design, with identical 2.10-inch rod and 2.65-inch main journal sizes and a common rear main seal. All LS engines uses iron crankshafts except the LS7, LS9 and LSA; they used forged steel cranks (4.00-inch stroke on the LS7; 3.62-inch stroke on the LS9 and LSA). The crankshaft sensing function of the distributorless ignition system depends on reading the toothed reluctor wheel on the crankshaft. Early LS engines mostly used 24-tooth wheels and upgraded a few years ago to 58-tooth (also known as 58X) wheels. When building an LS engine, it is imperative the correct reluctor wheel is used with the compatible crankshaft position sensor and ignition controller. The crankshafts are mostly interchangeable, but the snouts on LS7 and LS9 crankshafts are approximately 1-inch longer to accommodate their two-stage oil pumps that work with the engines’ dry-sump oiling systems. These forged crankshafts can be used on wet-sump engines by using a few specific components and/or modifications. The easiest way to put a forged stroker crankshaft in your LS engine is using GM Performance Parts’ new LSX crankshafts, which are available in four stroke sizes up to 4.125 inches. They feature the standard-length snout and can be used without modification on most engines. LS7 and LS9 crankshafts can be used, but require special components and/or modifications to their snouts to accommodate standard, wet-sump oiling systems. LS connecting rods are very similar and interchangeable. Most are made of powdered metal, while the LS7 and LS9 rods are forged titanium. Rods lengths are similar, too, at 6.098-inch for 5.3L, 5.7L, 6.0L and 6.2L engines. The 4.8L engine uses 6.275-inch rods and the LS7 uses 6.067-inch rods. Since 2006, LS rods use bushed small ends. Also, LS6 rods bolts, P/N 11600158, offer a strength-enhancing upgrade to pre-2000 engines. Finally, because of the pistons’ inner bracing, non-LS7 rods will not work with LS7 pistons; and the LS7 rods have a slightly different size than other LS rods, requiring a unique bearing, P/N 89017573. The LS9 is the only production LS engine with forged aluminum pistons; all the other use hypereutectic (cast) aluminum alloy pistons – varied mostly by diameter to accommodate various bore sizes. LS cast pistons shouldn’t be used on applications greater than approximately 550 horsepower. Also, the LS7 piston’s inner bracing requires the use of the matching LS7 connecting rod. Introduced on the LS1 engine and used also on the LS6 and LS2, cathedral-port heads are named for the unique shape of the top of the intake port. Intake manifolds for LS1, LS2, LS6 and Vortec engines with cathedral-port heads are mostly interchangeable. 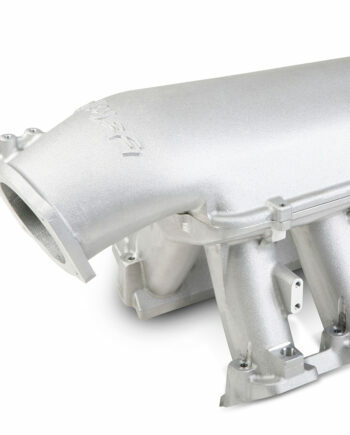 LS7-style – The second LS intake runner design debuted on the Corvette Z06’s LS7 engine. This rectangular design supports the straight-through airflow design of the heads. They feature 270cc intake ports and the ports and combustion chambers are CNC-ported from the factory. Use only with the LS7 intake manifold. L92 style – Similar to the LS7 design, but the ports are a little taller and a little narrower. They flow more than cathedral-port heads, but not as much as LS7 heads. In addition to the L92 6.2L engines, this port shape is also used on LS3 engines and some 6.0L truck engines, as well as the Corvette ZR1’s LS9 and Cadillac CTS-V’s LSA supercharged engines. Intake manifold bolt patterns are unique to this port design. These heads pioneered the rectangular-port design, but because they are designed for professional finishing, their final shape and size depends on whoever is performing the porting. Because of their comparatively small bores – 3.89 inches – LS1 and LS6 engines can only use LS1, LS6 and LS2 heads. Using heads designed for larger engines will cause the valve-to-block interference. The larger, 4.00-inch bore of the LS2 enables it to use LS1/LS6 heads, as well as L92-style heads (including LS3, LS9 and LSA engines). The 6.2L engines (LS3, L92, etc.) can use any head except for the LS7 and C5R, while the 7.0L LS7 and C5R blocks can use any LS-series head. LS7 blocks should be matched with heads designed for at least 4.10-inch bores; and 4.125-inch bores are preferred. Most LS production cylinder blocks share the came cylinder head bolt pattern and the same size head bolts – four 11mm bolts per cylinder (10 in total) and five upper, 8mm bolts. Early LS1 and LS6 engines used different-length 11mm bolts, but engines from 2004 and later use same-length bolts. LS9 engines use stronger, 12mm head bolts. 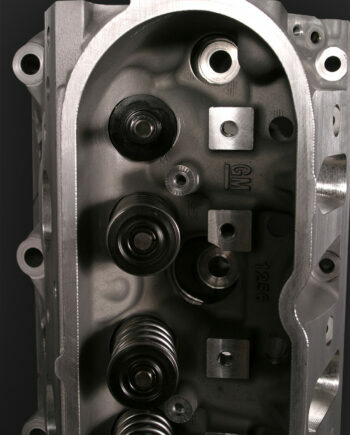 Non-production blocks, such as GM Performance Parts’ LSX block and the C5R, offer the same head-bolt pattern as production blocks. All LS heads will bolt up to them, but care must be taken to select the most compatible heads based on the appropriate bore size. Because of their large bores, heads designed for at least 4.10-inch bores should be used and 4.125-inch bores are preferred, such as the L92/LS3 or LS7 heads; otherwise valve-to-block interference is an issue, as is sufficient cylinder sealing. GM Performance Parts’ new LSX cylinder heads use 10 11mm and 13 8mm head bolts, or eight more than a regular-production LS head. That’s more than 50 percent more head bolts than production heads, supplying superior clamping strength.